Yesterday there was an empty yogurt container on the counter, next to a few dirty dishes. I passed by it, and had a panicked thought. You'd never find this at your mother's house. And the voice added, you are such a loser. The voice was so strong, so conclusive, that it caught me off guard. I just froze there in the kitchen, looking on at the mess. I knew the dishwasher was half empty, and that I could have easily put those dishes in, and recycled the yogurt container, but I truly couldn't force myself to do it. Even if the counters weren't completely clear, this wasn't the time. I could feel it deep in my being, that it wasn't the time to force. Yet, I couldn't fully accept that I couldn't do it either. I left to pick up my kids from school. I panicked that they would remember me as a slothful mother, and I felt all the broken around me. You know, that feeling that you are so far behind the game, that there is no bother even playing anymore. These feelings are pervasive, in moments, in myself, in people that I love. They often fill up the in between moments, when the high's and the ah-ha's have died down. Everyone I know is feeling lost and flailing on some level in moments, but unable to pull themselves up by their bootstraps and just get it together either. Because 'together' is fleeting, and we don't seem to be buying into the idea that it matters so much anymore. Something else seems to matter much more. I like to think that this inability to move is stopping the madness, the endless pursuit toward a cruel ideal that somehow lives and breathes so powerfully in our world. I like to think, as I have said countless times, that we are paving a new way that will reveal its importance in time--a new wave of connectedness that breathes peace. I am beginning to see this monster for what he is. He comes out to stomp on us from many places--from within, or from outside--often in the form of firm words from those well-meaning around us, who 'know' just what we should do. But perhaps it is precisely for these people, that we should be true to ourselves. For those who mask their own deep vulnerabilities--who rise up in anger (I am guilty of this!) because they can't handle our fragile state right now, our childlike gait, as we prepare to come out of our cocoon and spread our delicate wings--as we take a leap of faith, to find a new way to live, that doesn't resemble the old way, as we embrace our unique spirit and stop stretching it into shapes that won't hold. I called my mom. I told her my thoughts, and she helped me to put things in perspective. Her love helped me to remember. I remembered that I craved release, more than keeping up with my inner dictator. My heart's desire it to let everyone off the hook, including myself--to let the heart of us shine, even when surrounded by mess. I would rather that I teach my kids to let go of hating themselves if things aren't perfect, and to stop fueling the monster. I would rather my kids release me from being perfect, so that, we can drop into a place that really matters, where joy abounds, and judgement from an inflexible mind isn't part of the game. 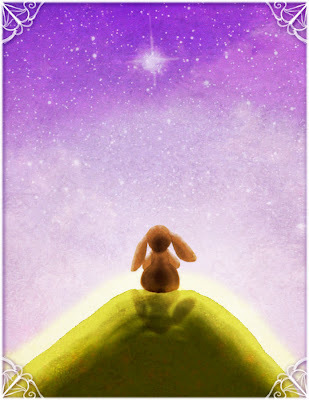 I'm reading a little story by Kate DiCamillo to my kids, called The Miraculous Journey of Edward Tulane--about a toy china bunny who begins to find his heart after disaster strikes. He spends a year face down on the bottom of the ocean after being the casualty of two rowdy boys playing keep away on a ship, and then a half a year buried in a garbage heap at the dump, when he is maliciously thrown away. These experiences help him to understand the only thing that is important. Love. I guess I feel like this little bunny, set on finding out what is really important, no matter what anyone else shouts as truth, even if things are a little messy at times. I want to find love in a messy kitchen, with messy fighting from my kids, with messy routines and messy rejection, with fear and energy zaps, within faithless anger and condemnation. I want to become real like Edward and the velveteen bunny, who become clear about their priorities, who become more of who they really are, because they have no choice but to roll with what is thrown at them. I realize that when I am scared and lost, I become much less able to exist in messes. In fact, I find myself avoiding what is real by suppressing what is important, covering it up by demands and routines, by judgement and black and white thinking-- by kidding myself that I will have control, dammit! Then I enlist others, like my kids, to help, and use them as excuses to be angry, as they resist my need for order. And with all the warring going on, I can be in denial, that the truth is I am just f*cking terrified. I have had a strong image lately, of something that doesn't even exist in this world. It is you and I, just holding hands, sitting in the ether, feeling the buzz of something going on down below, that looks like a lot of running around. But there we are up above, just holding each other and breathing together through our contractions. We are joined together living the exact same experiences, even if they look different below: the energy of love and loss, of fear and failure, of confusion, of clarity, of preciousness. And all I want to do is just sit there and feel you with me, and tell you how much I love you, for no reason at all, for nothing that you've done, or will ever do--and I want to thank you for being there with me, and for holding my hand. I want you to know that it wouldn't be the same without you. I want to remember this image in those terrifying moments, and find myself relaxing into the truth. Then I want to feel thankful for these terrifying moments, and for the siren call just barely audible under the noise, of my soul, calling me home. Brooke. Your words touched every tired, flailing, exhausted place inside of me. Your words right now bring me more comfort than anything has in a long while. I see us sitting there, side by side--you leaning against me, I against you. Just BEing. That's it. "I have had a strong image lately, of something that doesn't even exist in this world." It exists now! Thank you, Brooke.